It should come as no surprise to you that you often can find the rock bottom lowest price thru the doors of a Big Box retail store. It may also seem that you are also getting a larger selection. With a large retail store you get a “standard size” product, meaning that their products fit “most” homes etc. However, you may not have a standard size opening for your shower or window. Trying to use a “stock” size product for a custom size opening can be a real headache. It may also end up costing more money and time in the long run. It is also no surprise that customer service in a Big Box store can be frustrating. They often move department to department and are rarely experts in that field. Here our installers on average have been here for 25 years. We know Glass, that’s what we do. That means you are quite literally getting an expert to help you. We send the person who will work on your project out to measure and give you an estimate. This is at no cost to you, all of our estimates are free, timely and no pressure. There is also a huge difference in quality of work that is custom vs. standard. 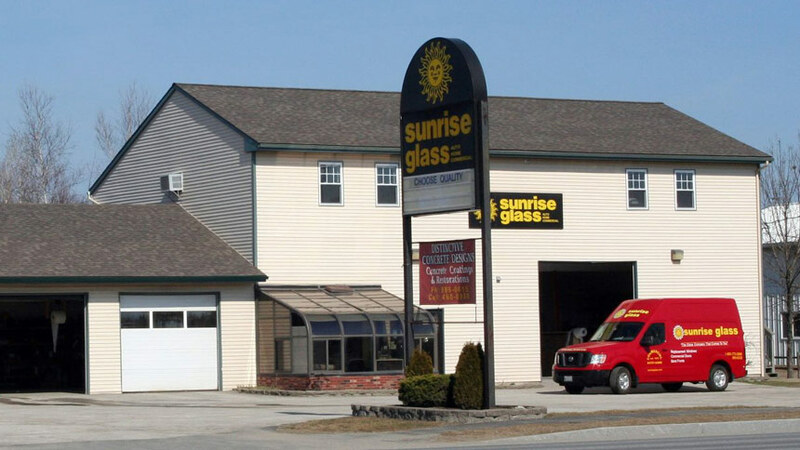 Our Glass is made in Maine, which allows us a quicker turn around time than most Big Boxes. You are also helping small business. We are locally owned and operated we are your neighbors and we REALLY do appreciate your business. If you ever have a problem, we will take care of you. Once again we are a small business and you are often dealing with the owner. We pride ourselves on customer service and quality. We want to be your Glass Company.